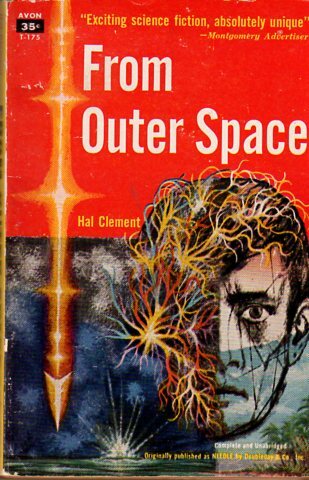 Needle, and Through The Eye Of A Needle, by Hal Clement – book reviews by Fred Patten. Dear Patch; Here is my review of Needle and Through the Eye of a Needle by Hal Clement that I wrote for Cubist’s Anthro several years ago. Maybe only one fan in a hundred will take the trouble to track these down, but they’ll probably be glad if they do. Another way of looking at it is that Dogpatch Press will have the only mention of these proto-furry books before there was a furry fiction genre. Garden City, NY, Doubleday & Company, March 1950, hardcover $2.50 (222 pages). 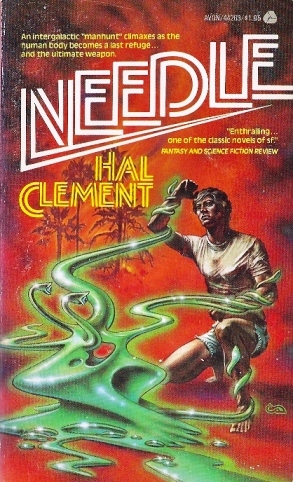 Hal Clement, whose real name was Harry Clement Stubbs (1922-2003), often told of how he wrote Needle as the result of a dare. 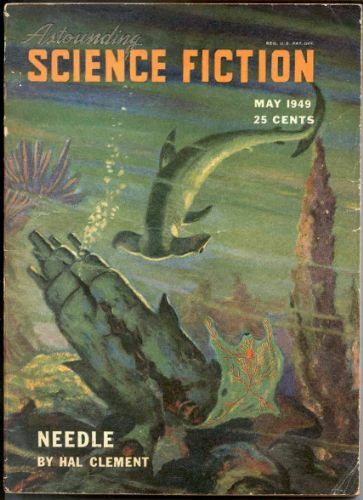 John W. Campbell, Jr., the editor of Astounding Science Fiction, the most prestigious s-f magazine in the 1940s, was given to making lofty pronouncements that were understood by his writers to be dares to disprove them. On one occasion, Campbell had said that it was impossible to write a genuine science-fictional mystery story. Any such would turn out to be a standard mystery with s-f trappings, such as being set in the future or around a superscientific macguffin; but stripped of those elements, it would turn out to be just a standard mystery. 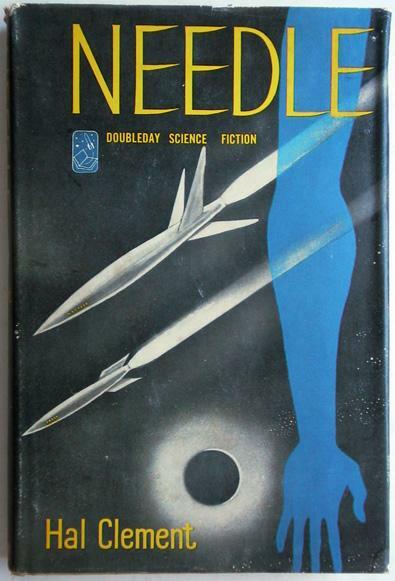 Clement wrote Needle, which Campbell conceded was a genuine mystery that could only exist as also a genuine s-f story. Campbell bought it as a two-part serial for Astounding in its May and June 1949 issues. The Hunter is a policeman of his people, and the Quarry is a fleeing criminal. Since the Hunter’s crash into the South Pacific Ocean completely destroyed his spaceship and killed his perit, he assumes that the same thing happened to the Quarry’s spaceship and perit. Both have to find new bodies for themselves. After some experimentation, the Hunter settles into the body of Bob Kinnaird, a teenager living on an unnamed small Pacific island near Tahiti. The Quarry has presumably also chosen a nearby human host. The island is wholly run by an American company that uses its fast-growing weeds as fodder-plants in large culture tanks to make hydrocarbon fuels. The Hunter has to find and subdue the Quarry before his host can leave the island, and the Quarry can escape into the billions of humans all over Earth. Serialization. Cover by Paul Orban. After several weeks of living within Bob Kinnaird’s body, during which the boy travels to boarding school in Massachusetts, the Hunter contacts him and reveals himself. This is probably Needle’s most memorable scene. Bob is an incredibly friendly host once he finishes freaking out over an intelligent virus or giant amoeba living inside his body, and he agrees to help the Hunter find the Quarry. Clement skillfully returns them to the island without making the transition seem contrived, and the last over-half of Needle consists of the Hunter and Bob investigating around the island like Holmes and Watson. They are both helped and hindered by their restriction against any test that might be dangerous to the suspect. Do nothing that can harm your host is an absolute law among the Hunter’s people; it is for casually abusing and endangering his hosts that the Quarry has been outlawed. The odds are that the Quarry has been relaxing inside some unknowing host, probably human. They must find him before he moves on. “‘That is, if he is ashore yet. All right, we’ll devote most of our attention to people. It’s just as well, I guess; we have a needle in a haystack as it is.’ The Hunter was familiar with Bob’s expression from his reading. Through the Eye of a Needle, by Hal Clement. Map by Bob Porter. NYC, Ballantine/del Rey Books, June 1978, paperback 0-345-25850-9 $1.75 (x + 197 pages). Clement finally wrote Through the Eye of a Needle (cover by H. R. van Dongen) almost thirty years later. The unnamed island is now Ell Island, named for its L-shape, and the small amoeboid Hunter is specified as “four pounds of jelly distributed throughout the man’s [Bob’s] body cavities”. (p. 2) The Hunter, stranded on Earth, has continued to live inside Bob with the latter’s permission. The island is run by Pacific Fuels, Incorporated to manufacture biofuels. “… and the population of the island had been climbing. It had been about one hundred and seventy when the Hunter had first come ashore on Ell nearly eight years before, after his crash in the ocean outside the reef; now, both he and his host knew, it was about fifty greater.” (p. 5) Bob’s parents and the island’s doctor have known about the Hunter since the end of Needle. Bob, now entering his twenties, has just returned because he has graduated from boarding school and college on the mainland. But the real reason is that he is slowly dying – and the Hunter is killing him. This is also a potential disaster for the Hunter. How will he survive when Bob finally dies? With his ingrained repugnance against harming his hosts, he cannot simply transfer to another body now that he knows that he is ultimately deadly to any Earth lifeform. The Hunter’s people, an interstellar civilization, are used to encountering new lifeforms and solving any biological incompatibility issues. But the Hunter is a detective, not a medical specialist. 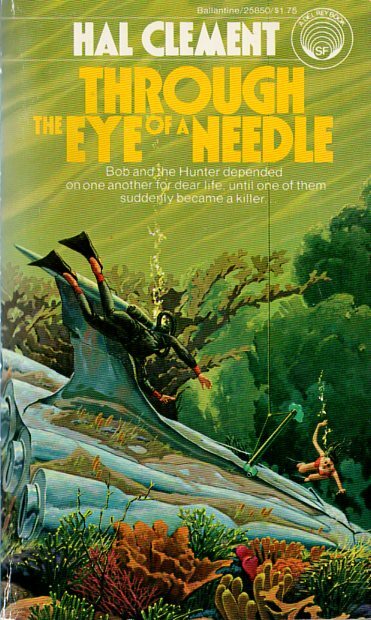 Bob and the Hunter decide that their only hope is if others of the Hunter’s people have followed him and are exploring Earth to find him or the Quarry, and to contact them. Complications are that PFI, although a benevolent company, expects Bob to work for it for several years in return for its having put him through college; Bob’s annoying little sister Silly (Daphne) insists on following him everywhere; and that Doc’s teenage daughter Jenny is dropping Mysterious Hints that show she somehow suspects something. 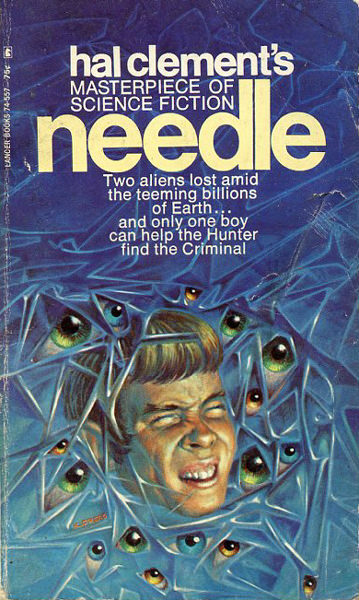 Where Needle was about the Hunter and Bob alone searching for the Quarry, Through the Eye of a Needle has a small team of Bob and the Hunter, Doc Seever and his daughter Jennny, Bob’s little sister Daphne, and another young islander, Maeta Teroa, looking for the evaluation team from the Hunter’s homeworld that they hope has followed him to Earth. Their search is complicated further when their equipment starts to be sabotaged, and Bob is stabbed. Have they become the target of island juvenile delinquents, some human with an unknown reason to stop the group, or is the Quarry still alive? 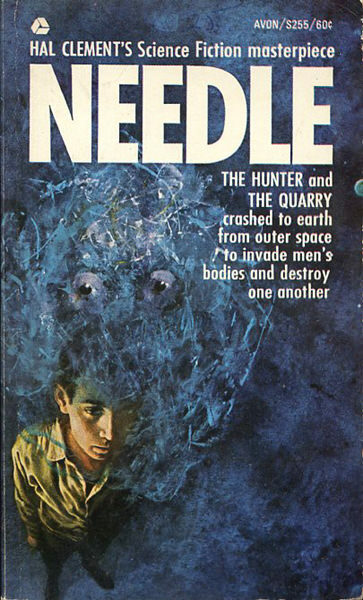 Needle and Through the Eye of a Needle can’t really be called Furry, but they feature a strong anthropomorphic very non-human character. The Hunter comes out of Bob much more in the sequel, and is present in the team as four pounds of amorphous greenish jelly. 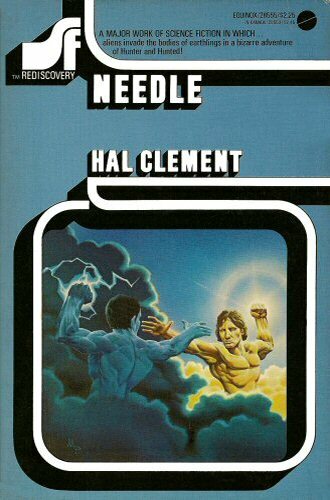 “Needle” and Hal Clement’s other s-f books are good examples of how an author can be very popular and omnipresent during his/her lifetime, and disappear almost immediately after death. Who has Clement’s copyrights to reprint his books today? Who is interested in publishing new editions after the author is no longer around? I wonder if that has to do with his relationship with the fan community as much as his work itself? Hal Clement was friendly to fans and was a regular attendee of the annual Worldcon. I can’t imagine such popular novels as “Needle”, “Mission of Gravity”, and “Iceworld” suddenly disappearing after his death for any reason other than the lack of Clement himself to promote them. Well, a contributing factor could be the publication of “The Best of Hal Clement” and so many de luxe or definitive editions of his stories. Most s-f fans today will try to get one of those definitive editions, even in a used copy, rather than a new reprint.